General. 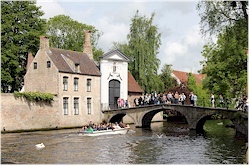 Bruges has many nicknames such as "The Venice of the North" or "Die Scone" (the beautiful one) because of it's historic center that is traversed by various canals. It became a very wealthy town in the Middle Ages due to international trade, attracting people from all over Europe. Now it's attracting many other visitors: tourists from all over the world. 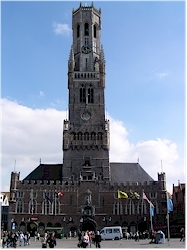 Bruges was cultural capital of Europe in 2002 and has several inscriptions on the Unesco heritage list (the belfry, the beguinage and the town center). If you are a history lover, it will be difficult not to be charmed by Bruges' architectural heritage but besides that, it is a nice and safe place for shopping, dining or just having a good Belgian beer on one of the many terraces. Diverse activities are organized throughout the year ranging from a big Christmas market, fairs and processions to outdoor concerts. Brief history. It is not clear when the first settlements came to existence in the area of present-day Bruges, but traces have been found dating to the Roman period. Geographically, the location of the town is very logical: it lies on the border of the sandy area and the polders (back in the early days it was a partially flooded coastal area with navigable inlets) and the mouth of a small river called the "Reie". In the course of the 6th and 7th century, the settlement starts to develop properly. By the end of the 9th century, Bruges was already important enough for count Baldwin with the Iron Arm to build a castle in the center, making it the capital of the "pagus flandrensis" (the young Flanders which was at that time still limited to the area around Bruges). In that period, the first walls were erected to protect the town. Until the middle of the 11th century, the port was immediately accessible from the sea, turning Bruges at that time already into a center of international trade but the gradual silting up of the coastal area made it increasingly difficult for ships to reach the harbour. The tide turned in 1134 when a huge storm carved a large navigable gully (the "Zwin") in the land north of the town. A channel was dug linking Bruges with the gully and at the end of that channel, a new outport arose: Damme. This was the beginning of most prosperous period for Bruges. However, this access to the port was in its turn also subject to the silting up and great effort was needed to keep the passage open. Despite all the efforts, by the 14th century Damme was no longer reachable for the largest ships and the center of gravity shifted closer to the sea, turning Sluis into Bruges' main outport. 1568 is a year of disaster because it is the start of the 80-years war between Spain and the Northern Netherlands. When Sluis was captured by the Northern armies, Bruges was disconnected from the sea and from its most important source of income. This was the end of prosperity and one of Europe's biggest tradecenters turned into a sleeping provincial town. Lateron, the industrial revolution had only a minimal impact on the region. 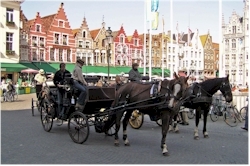 Due to the economic standstill, Bruges was in the 19th century even one of the poorest regions of Flanders. Bruges' mishap in that period is now it's fortune: it's historic center survived the effects of time and progress which fueled the emerge of a new industry: tourism. Bruges, center of international trade and finance. During several centuries, Bruges was the most important town in Flanders and one of the most important ones in western Europe. Its success was the result of different factors. The base for Flanders' richess was the textile industry and related products. Textile and domestic produce were exported and goods from all over the then known world were imported via the port of Bruges for distribution to the wide hinterland. All this international commercial activity in turn attracted financers and bankers, mainly from Italy (Florence, Siena, Lombards,...). Names such as de Medici and Portinari were well known in Bruges. Bruges' lace. One of Bruges' most renowned products is lace. It finds its origin in the beginning of the 16th century and had its heydays until the end of the 18th century. Contrary to the cloth industry, which was organized in craft organisms (so-called "ambachten"), lacemaking was labor-intensive homebased work. Nowadays, it is only practised anymore as a hobby or art craft. Lace can still be found in several shops in the center of Bruges and is one of the most typical souvenirs. Filmset Bruges. Bruges has been the setting for several local productions (series mainly) but recently also for a few bigger international movies. The most well-known probably is the crime comedy "In Bruges" by Martin McDonagh (2008) with Colin Farrell, Brendan Gleeson and Ralph Fiennes in the main roles. The town has also been discovered by Bollywood. The Indian production "Peekay (PK)" with actors Anushka Sharma and Sushant Singh Rajput has been partially shot in Bruges (2014).